Over 15 years of experience coupled entirely with the most skilled experts will be what makes your custom glass project with City Mirror & Glass Inc a success. Our designers for custom glass services in Cary, NC handle a wide array of custom glass services that involve various different options and applications. Create a more aesthetically pleasing space, while catching the light to create the illusion of a large room. An elegant glass enclosed shower is the perfect way to incorporate sophistication and style to your bathroom. Windows and doors make up a huge part of the outdoor aesthetics of homes. If you need any custom glass services in Cary, NC our custom glass professionals are the experts you can count on. Our custom glass designers make sure to guide you through the process of custom glass services in Raleigh. From the conception to completion, you will be on the same page with our team of custom glass experts. We have previously done the same great work for countless custom glass customers in Raleigh, Cary, Durham and the rest of the Triangle area for over 15 years. City Mirror & Glass Inc. makes sure that whatever project for custom glass services you come to us with is done stress-free with the results that you desire. 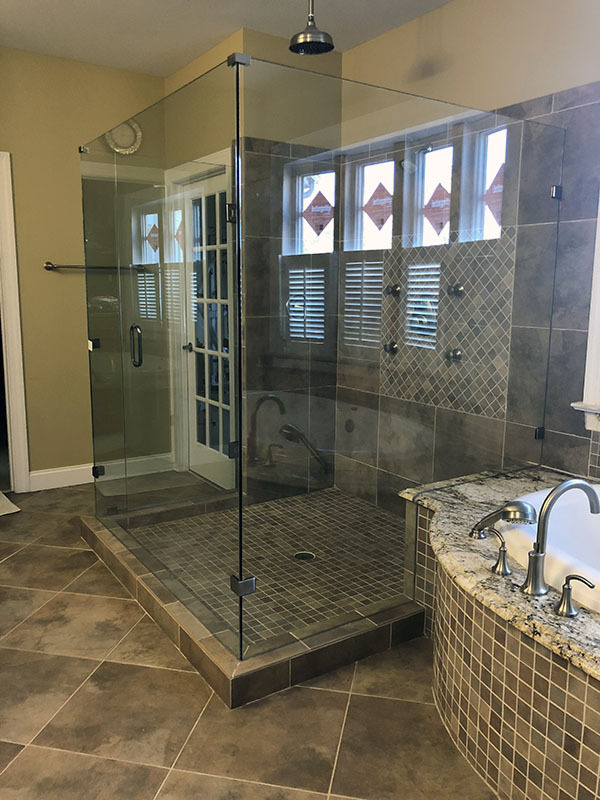 Whether you want to remodel the bathroom, replace foggy windows, build new custom mirrors, or tabletop, we make sure the custom glass project is done right and in a timely manner. We have encountered and successfully completed numerous different custom glass services ranging from quick-fix jobs to entire custom glass renovations. This has enabled us to be trained and experienced in a diverse range of custom glass and custom mirror services in Raleigh, Cary, Apex, Holly Springs, Durham, Wake Forest, Clayton, Zebulon and Surrounding areas. For over 15 years, City Mirror & Glass Inc. has been providing a full range of high-quality custom glass & mirror services in Raleigh and surrounding areas. We specialize in Frameless Shower Enclosures, window pane repairs, table tops, custom mirrors, and much more! We provide all of these services in Raleigh, Cary, Surrounding Areas at affordable prices, using only high-quality products designed to your requirements by certified custom glass designers. Our commitment to our clients and keeping their needs first is what has kept us above the competition for best residential custom mirror and custom glass services in Raleigh for a decade and a half. Our superb customer service and also the high quality of our custom glass products as well as the quality of our installation has contributed to our title as best custom glass services in Raleigh and Cary. If you want to contact us about any glass or mirror issues call us at (919) 377-8463 or send us an email. If you would like to submit a proposal for consideration simply get a quote. We offer same day custom glass services in Cary, NC and surrounding areas. We also provide 24-hour custom glass emergency services. For all your custom glass service needs give us a call or email us and we will be happy to assist you! I have never had a better experience with a small business. Not only do they have a high quality for workmanship but are also prompt, affordable, detailed, and clean. Ramon replaced all 6 of my windows in my dining room and the quality of work to make sure it was done correctly was outstanding! They truly care about the customer and will bend over backwards to make things right. All the things you look for when hiring someone you will get with City Mirror & Glass. His team is very knowledgeable and helpful. Thanks City Mirror and Glass...my windows look awesome! City Mirror & Glass Inc. is the best remodeling company I have ever worked with! They are fair, honest, clean, and respectful. The level of expertise is unmatched and their work is the highest quality! I highly recommend this company!!! They are very thorough and want every detail to be exactly perfect. I really appreciate when someone cares about their work and takes pride in a job well done.. They give 110% from start to finish! Great job guys! Thank You!